Thai Airways International (THAI) reported an operating loss of 3.69 billion baht in the third quarter, up 103% year-on-year from 2017. THAI president Sumeth Damrongchaitham, who has pledge to cut and then eliminate the airline's losses, blamed the bleak July-to-September financial results "partly" on natural disasters, decreasing numbers of Chinese tourists and rising oil prices. 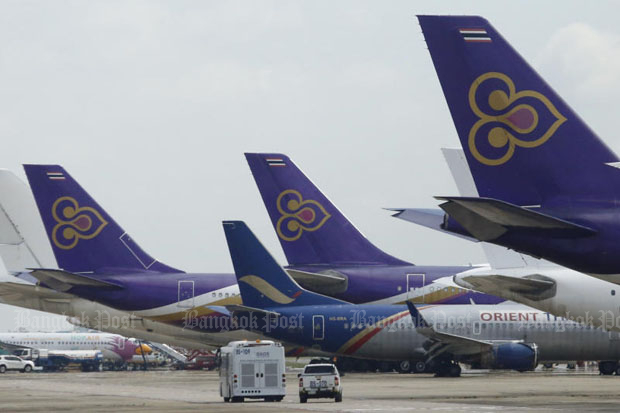 Mr Sumeth said the loss came despite a 2.2% rise in total revenue of THAI and its subsidiaries - 47.95 billion baht between July 1 and Sept 30, including income from passengers, excess baggage, freight and mail. But operating costs hit 3.69 billion baht, up 1.87 billion baht compared with the same three-month period last year. Passenger loads dropped slightly to 77.5%, compared with 78.2% in the corresponding period of 2017. Mr Sumeth said the third quarter was normally the low season. At the same time, the national airline had to cancel many flights due to Typhoon Jebi that hit Japan, an earthquake in Hokkaido and Typhoon Mangkhut that struck Hong Kong. The decreasing number of Chinese tourists was also a shock to the bottom line. He said that total expenses in the third quarter rose by 11.3% year-on-year, mostly due to rising fuel costs. But the quarterly report said non-fuel operating expenses increased by 5.5% year on year, a factor he said was "due mainly" to higher maintenance and overhaul costs, along with rising aircraft and spare part leases. As of Sept 30, THAI's total assets amounted to 277.61 billion baht, down by 1.1% from the end of 2017. Total liabilities were 249.22 billion baht, up 0.2% from the end of 2017. As of Sept 30, the airline has 103 active aircraft, four more than the same period last year.